"They shipped my cards in two days and I received them within a week. They have the best prices and best product anywhere. This vendor truly deserves a 5-Star rating. Amazing. Loved it!" Have you ever been given cash money at the bank or found a hundred dollar bill on the ground? 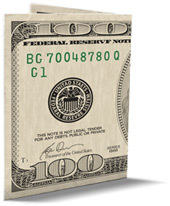 With dollar bill dropcards you can re-create that feeling of receiving fresh, crisp dollar bills for anyone. Whether you want to promote your business or fool your friends, dollar bill cards can help you meet your objectives. These novelty cards look and feel like real money, but are not as wide as a real dollar, so that you can fold them in half and see the look of surprise on someones face when they unfold them. We offer a $1, $5, $10, $20, and $100 novelty USD bill. On the back side, there is space for your own creation which you design online. Once you place your order, the realistic novelty cash is shipped directly to your door. Perfect for promoting events and generating interest. We allow you to easily customize your dollar cards to suit your business. Get the widest selection, highest quality, and most cost effective on the market today. Easy to use online editor makes it simple to design yours with custom text and images. We are certain that you will be 100% satisfied with your order and we even offer a money back guarantee! Our money business cards are the most realistic. Order your own dollar bill business cards today with our easy to use and feature rich design tool. $100 bill business cards are a great idea for any event. Your search for the most cost effective and realistic dollar bill cards is over. As the first website to start selling dollar bill cards, you will find the best and most realistic right here!